In today’s age of social media, the beauty industry has experience a dramatic shift. Magazines like Vogue and Harper’s Bazaar no longer hold the lion’s share of influence over which look is cool and stylish. A lot of people, especially millennials, now look to Instagram and the celebrities who use it to learn about the hottest beauty trends. Instagram has become a diverse playground for beauty hacks and trends that anyone can take inspiration from. Among the beautiful celebrities famed for their ‘Insta-game’, here are three who represent distinct looks that set them apart from the crowd. Hailed by Vogue as one of the original “Insta-Girls”, Cara Delevingne's fame practically started because of her social media presence. She is like no fashion model the world has ever seen before; she’s quirky and rebellious. These characteristics also describe her style at various high profile public events. Much like her own personality, her style often goes against the grain. 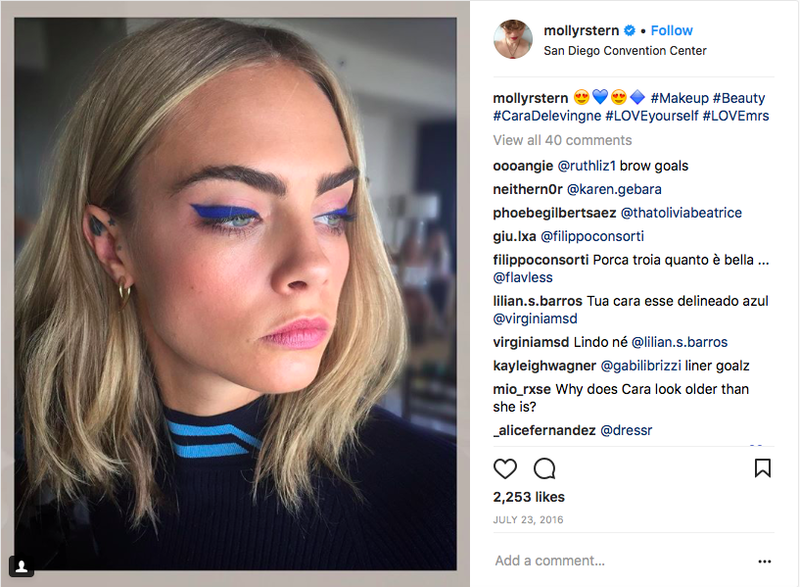 She turned heads with her electric blue eyeliner and soft pink eye shadow during Comic Con 2016 while promoting Suicide Squad. Molly Stern, the model’s makeup artist, complimented her eye makeup with a rose pink lipstick. The combination gave Delevingne a look that was subdued, but with the touch of quirkiness that she’s made her trademark in recent years. When it comes to looking au naturale, Rosie Huntington-Whiteley springs to mind. The former Victoria’s Secret Angel rarely uses dramatic or over-the-top makeup styles to showcase her delicate features. The Plymouth-born model opts for a cleaner and simpler aesthetic, as proven by her own makeup video using items from her collaboration with Marks and Spencer. Huntington-Whiteley showed how you can achieve a red carpet-ready look with just a touch of blusher and few swipes of mascara. Currently, her video has amassed over 1.2 million views, showing that she is very much a icon in her own right. The beauty industry is becoming more diverse, and Priyanka Chopra is among the women who proudly embrace their ethnic features – a quality she often expresses through Instagram posts. The actress usually applies black mascara to highlight her dark almond-shaped eyes. Her plump lips, meanwhile, are frequently covered with vivid shades of lipstick, such as maroon, which she rocked at the 2017 Golden Globes. Accentuating her distinct features makes her stand out among her co-stars, and this was prominent in the 2017 Baywatch remake. Chopra was part of a diverse cast, alongside Dwayne Johnson who has Samoan ancestry, and Ilfenesh Hadera who has Ethiopian roots. Additionally, some of the cast from the classic TV series were also present, including David Hasselhoff and Pamela Anderson, because, frankly, it’s difficult to imagine Baywatch without the famous duo. The original cast even recently appeared on a digital Baywatch slot game demonstrating their lasting appeal 15+ years since the television show was pulled from prime time television. Their presence in the 2017 film was regarded as a “passing of the baton” of sorts. With such big stars around her, Priyanka Chopra was able to shine, thanks in part to her exotic beauty. Aside from her on-screen projects, Instagram has been an effective platform for the South Asian beauty to show that women should celebrate their best features. As Instagram’s reach becomes larger by the minute, celebrities’ influences grow too. The best part of it all is that they have the power to break the mold and set new trends that can inspire the world over. Blog written by Jasmine Hilton.